What Are the Social Security Trust Funds, and What Exactly Is In Them? In spite of it being such a crucial cog to retirees’ bottom lines, there’s a lot that seniors, and the American public as a whole, just don’t understand about Social Security. Let’s look at what we might call Social Security’s heartbeat—its Trust funds—and explain what they are, how they get funded, and where the money that’s collected winds up. Broken down to its basic components, Social Security’s Trust funds are two separate accounts where money collected is deposited. These accounts are: the Old-Age and Survivors Insurance Trust (OASI), and the Disability Insurance Trust (DI). It’s worth nothing that while a combination of the OASI and DI Trust’s doesn't technically exist, the Social Security Board of Trustees report, and even the SSA, will refer to the fictitious “OASDI” when describing the full program or discussing its long-term outlook. Payroll tax: Without question, the largest contributor is the 12.4% payroll tax on wage income of up to $128,400, as of 2018. Interest income: The second-largest contributor is interest income earned by Social Security’s $2.9 trillion in asset reserves. Taxation of benefits: Lastly, $37.9 billion was collected in 2017 as a result of taxing Social Security benefits. As you can probably guess, most of the money collected each year winds up going right back out to pay beneficiaries. In 2017, $941.5 billion of the $952.5 billion in program expenditures were benefit payments. This included $798.7 billion to the OASI Trust, and $142.8 billion to the DI Trust. The remaining expenditures include $4.5 billion to the Railroad Retirement financial interchange, and $6.5 billion in administrative costs. This left a surplus of $44.1 billion in 2017 that was added to Social Security’s asset reserves. Then there’s the money left over, known as Social Security’s asset reserves. Almost $2.9 trillion has been built up over the past 35 years. 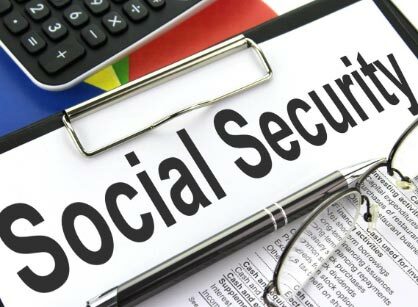 By law, the Social Security Administration is required to invest its excess cash into special-issue bonds, as well as certificates of indebtedness. The average yield on its investment portfolio, which has numerous maturity dates and yields, is 2.9%. An even easier to way to understand this situation is to think of it this way: Social Security is lending the federal government money, and the federal government is paying interest on that loan, plain and simple. You can find the full article at The Motley Fool.